On the Fanatics FB group recently there has been an upsurge in discussion about mathhammer (or expected outcomes when rolling dice). There seems to be a real lack of knowledge regarding the maths of probability and what the relevance of expected out comes are. I thought I'd show a couple of things that you should be aware of, because in considerations of probabilities "A little knowledge is a dangerous thing". And just to give my thoughts some cred, I traded financial derivatives for twenty years and saw fortunes lost because people didn't understand such concepts as fat tails, long tails, volatility "smiles" and skews. The Global Financial Crisis was largely caused by people believing the numbers outputted from their "black box" computers without understanding the maths or assumptions behind both the inputs and outputs. Just Remember "It's all about the Greeks"
When you roll two D6 dice you have a range of outcomes from 2 to 12. You have an expected outcome of 7, with one chance in 36 of getting a total of 2 and the same of getting a total of 12. The important thing here is that your expected outcome is 7 although that only has 6/36 chances of being the actual outcome. 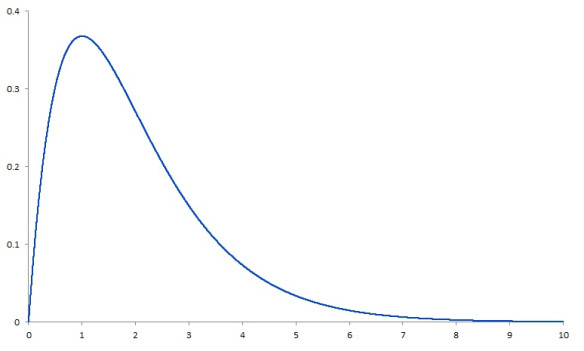 What you in fact have is an expected outcome "centred" at 7 that follows a normal probability distribution pattern. This is the pattern we all know and love - and should be make out wargaming decisions based on. In most cases. The important thing here is that this is a normal distribution pattern with no skew - and very importantly clear defined boundaries 2 and 12. Your opponent's Ratkin Tunnel Slave Horde has 30 25 attacks. It hits on 5+ and has no modifiers to hit or wound. Against a unit with Defence 5 it should do 2.8 wounds. However that doesn't tell you the full story. If he roll badly he might do 0 wounds, right? But if he rolled well then conceivably you could be wounded up to 25 times. It's not likely to happen but it is possible. Looking at the maths there is approximately a 90% probability he'll do at least 1 wound, around 70-75% that he'll do at least 2 wounds and 50% he'll do 2.8 wounds. But what about the other side? This is where we have a skew and a fat tail. 16% (or 1 in 6) he'll do over 4 wounds, one in 20 times he'll do 6 wounds and one in 100 he'll do almost 8. There is an infinitesimally small chance that he'll do 10+ wounds but a chance exists all the way up to 25 wounds. The above is an example of what you would expect to see (ignore the axes). In our example the hump of the curve is centred on 2.8 while the left hand side of the curve intersects (as above) at zero. The important point is that the tail extends all the way to 25. 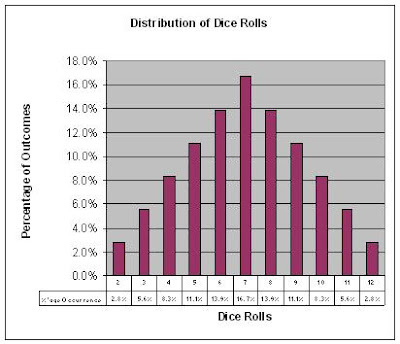 One thing in our favour is that the tail can be calculated - because it is a closed system of 2 dice roles with specific obtainable outcomes (0 to 25). In real life (finance, economics etc) things aren't that simple ..... that's why you seem to get 100 year floods every 10 years! The overall takeaway is that be careful what you "expect". 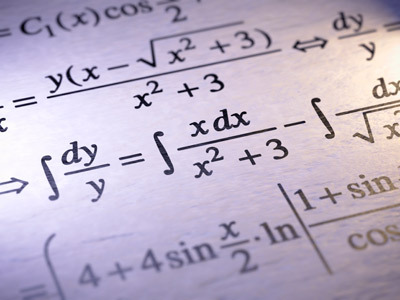 Mathhammer is a great tool but be aware of the underlying assumptions. 100% agree with all this stuff. You should be making your decisions based on odds, not on expected values. I highly suggest using a calculator to get a sense of how hard it is, and unlikely it is, to kill certain types of units. At some point I am going to try turning this into a google app. Pete any help when I next go to sky city? To make it simpler for myself, as there's always a timer on games (even when there isn't - you just can't take a whole weekend for a single game), I usually do the quick math for the expected outcome of rolls and add 2 to both ends. That usually covers most percentages, and anything "once in a lifetime" can't be based strategies on. In your example I'd expect the unit to deal anything from 1 to 5 points of damage to the Def5+ unit. In case of 10 attacks on 3+ 3+, you'd expect to have 4,489 wounds in - in reality plan for anything from 3 to 7! Anything beyond those odds are off the scale of probabilities - possible, but not probable. Good post, while I found while playing WHFB that most players could appreciate their expected values, I found relatively few who had much of a grasp on variance. Those were the dangerous ones because they came up with plans that were designed to work when variance went against them, but were also capable of identifying when right hand skews existed which they were ready to take advantage of.